Why Should Your Business Have a Mobile Presence? An App can be very simple (really, much more simple than a website), but it will exist on your customers' device as a proud icon, reminding them of your business every time they look at their phone. You never had this from a website. Can I Get Away WIth Just a Mobile Website? My website is designed to work on mobile devices, surely that is enough to satisfy the need for a mobile presence? It's a fair question. A mobile website is a website that detects it is being viewed on a smart device, and tailors the rendering of its pages (images, buttons, text size, etc) accordingly, so that the result is acceptable for viewing on the device. If your business has a limited budget, this will at least get you visible on a smart device. The truth of the matter though, is that you need both a mobile-capable website AND a mobile app, in order to get the benefits of a true mobile presence. Businesses that limit their mobile presence to a mobile-ready website risk the scenario known as "buy and bye". This is when a customer finds your business using mobile search, perhaps browses or even buys something from you, but then disappears, possibly forever. However, you also need to align your mobile app with the information you provide on your (mobile) website. New customers need to "discover" you too, and this happens through internet search engines accessing your website. Businesses that are most successful at marketing themselves use their mobile website to attract new customers and convince them to download their app. This creates an opportunity for a profitable, ongoing relationship via engagement, "stickiness" (loyalty) and tailoring a more personal shopping experience. 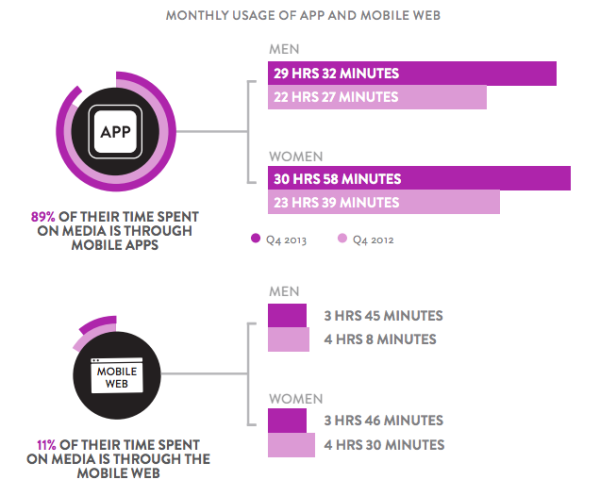 15,000 web and mobile apps launch daily. This number increases by 1% each week. Each year this amounts to 5.4 Million apps. In 2014, Flurry (a mobile analytics firm) reported that mobile apps accounted for 86% of the time the average consumer (US) spent on their mobile devices, compared with 14 percent for mobile web browsers. Recent data from Adobe/eConsultancy shows that nearly two thirds of companies surveyed stated that they planned on increasing their mobile investments in 2015. 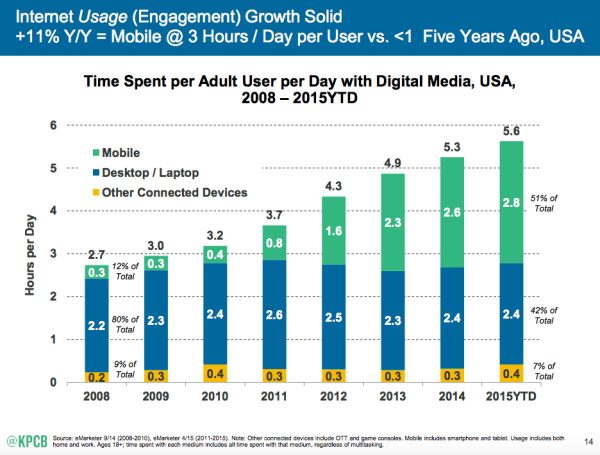 Since 2008, the average smartphone user has gone from spending just a few minutes a day on their device to spending nearly three hours each day consuming mobile digital media. In November 2013, Google released research mapping the path to purchase for mobile customers across nine verticals (including restaurants, travel, fashion, health, automotive, and home and garden). Consumers are more dependent than ever on their mobile devices as they move along the path to purchase. Consumers expect information on demand—and proximity is the key to conversion; geolocation services enable businesses to anticipate and meet their customers’ needs. Mobile marketing is the key to capitalizing on impulse shopping by delivering a highly personalized shopping experience. Well, What About The Competition? My Competition Isn't Doing It, So Do I Need To? About 15% of small businesses had created a mobile app by late 2015. Don't be left behind while competitors offer more conducive engagement with your existing and potential customers!